Listed Cheaters Read Only Section, Lists All known Cheaters and Cheaters Details. 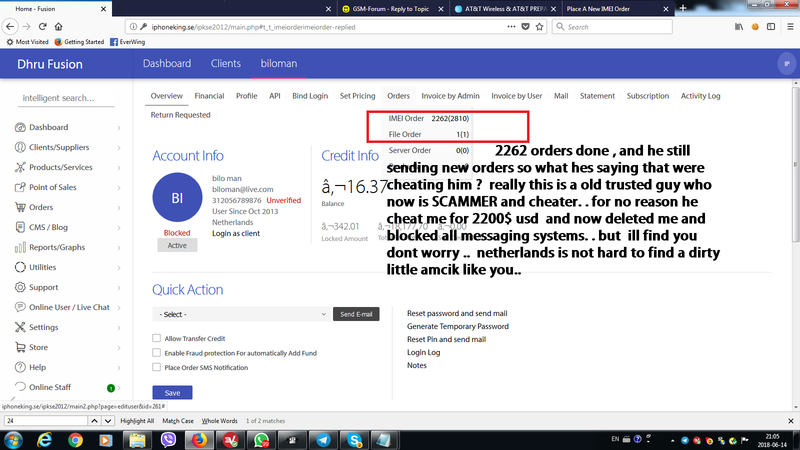 so i collected imeis and sent him payment $2200 as hes paid me many services over the years and no issues ..
he deleted me from sonork now and skype also . BEWARE CHEATER ! u will pay for this..
BEWARE ANYONE these days cant trust anyone .. Maybe this guy is begging on corner in netherlands these days who knows.. all of a sudden old trusted friend and client just turn to cheater , i guess he figured i would be easy as we had trust..
well i had just posted proofs of unlocking his imeis but for some reason u deleted it ? And is he the thread starter or me ? I have unlocked many imeis for him over many years..
then a week ago he came and offered me icloud fast 100% service. I naturally trusted him , as he prepaid always all those years and never any issues as said again , he was trusted and i thought of him as a trusted client and friend. 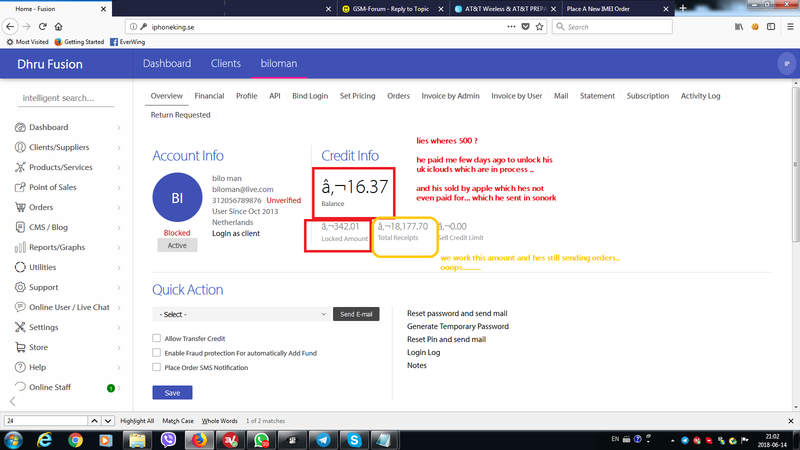 So i paid him as can see above.. then he hid offline for a week , came back online told me hes a cheater now and bye bye and blocked me from sonork and skype etc..
he had paid me 1k for some solution over 1-2 years ago now and because the solution was a simple one but i had already explained terms of service for that before and he was very adamant that he wanted the solution and it was sold as is. so he paid me 1000$ for that .. and he got the solution.. which worked 100% at the time,..
now 2 years later he try to cheat me and use that as an excuse because he doesnt need what he paid for anymore ..
mind you.. in all this time he was still sending me work and "hey bro " etc etc messages and never mentioned or brought this up at all .. The issue here now is that hes cheated me for $2200 usd for imeis that i sent to him..
what the heck is this ? this guy stole my money and split the original post and took one of the posts from here and got him to make fake post against me ? beware scammers on all levels here..
some dirty cheaters always trying to tarnish names of good people..
[email protected] is now a cheater and your thread (the one you started) moved to cheater area! When you start your thread, [email protected] started other with the same answer it made on your thread, thus the 2 threads: the one you started and the one [email protected] started once he noticed you started yours about him! So, take a deep breath, drink a tea and start to read all, after you acknowledge that now you are awake! Take care and don't go against the universe, because it has peculiar ways to turn against us (the universe that is...)! 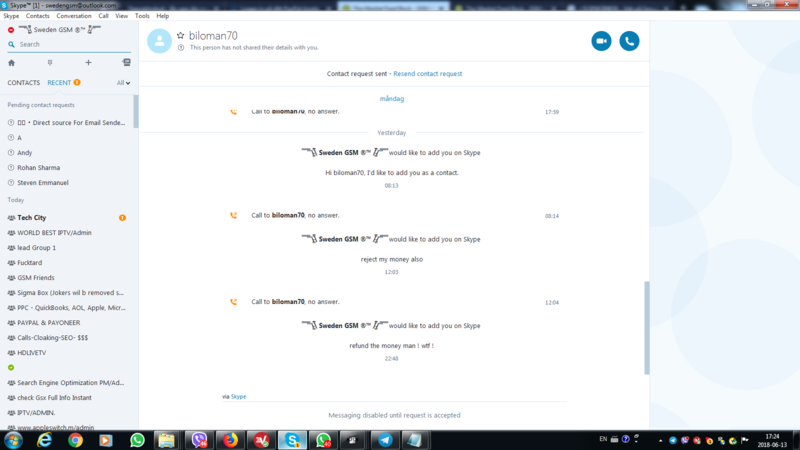 beware this scammer is still lurking..